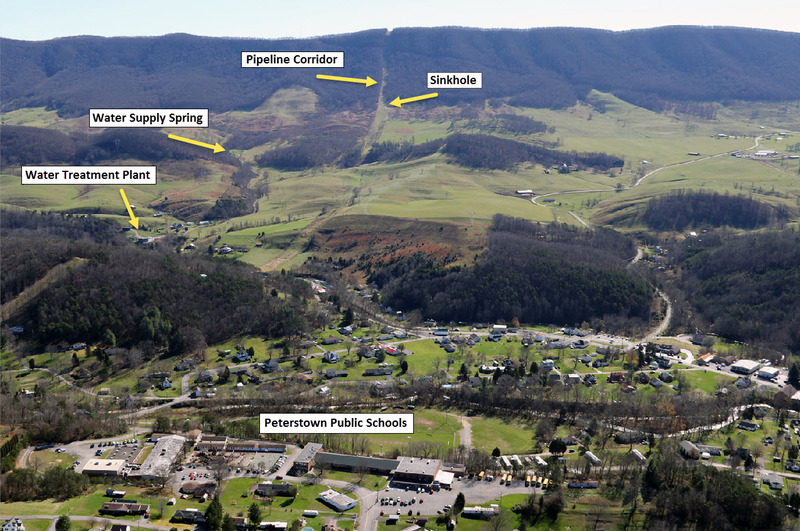 Examination of the Columbia Gas of Virginia pipeline project over Peters Mountain in Giles County is informative with respect to both careless pipeline construction practices and regulatory system failure. It was thus surprising to see the recent op-ed piece by company spokesman, Robert Innes, who objects to our complaints about the project. Why would he want to draw more attention to this project, which reflects so poorly on both Columbia Gas and the Virginia Department of Environmental Quality? This is the same project that was associated with diesel fuel contamination of a public water system last summer. This is the same project where runoff from the construction corridor continues to discharge into a sinkhole. And this is the same project for which DEQ did no inspections during construction, for which DEQ did not review erosion and sediment control and stormwater management plans prior to or during construction, and for which DEQ granted two variances (1000 feet and 2000 feet) to the 500-ft open-trench-limitation minimum standard. The following is provided in response to Mr. Innes op-ed. Note that Mr. Innes addressed only one of the problems with the pipeline project in question. (1) CGV failed to properly install and maintain required erosion and sediment control structures. Note: WID’s are runoff water interceptor diversions. Our observations indicate that few if any WIDs were in place during the construction phase of the project, nor were they installed properly post construction. 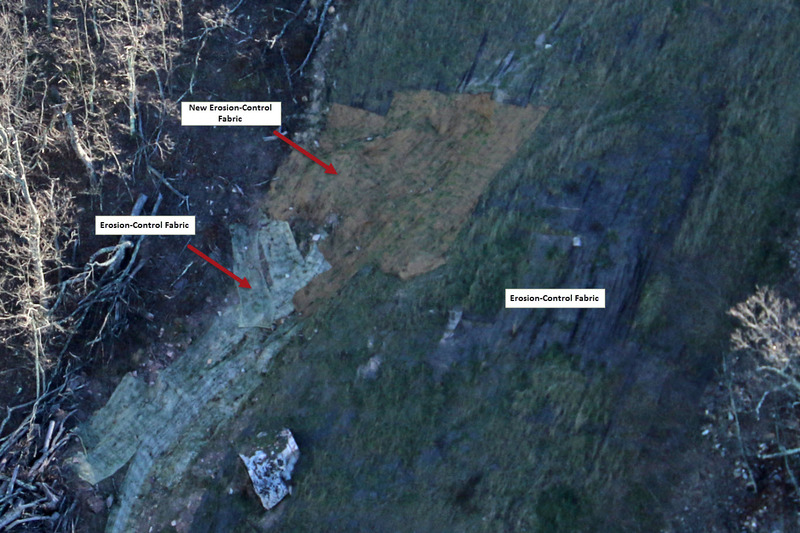 (2) CGV failed to identify and protect sensitive environmental features. Note: No one identified the sinkhole that is now receiving the channeled discharge from the pipeline corridor. DEQ would have seen the sinkhole if it had inspected the project site prior to or during construction. Note: In a 7/16/15 site visit following the contamination incident, the DEQ identified the diesel fuel spilled near the sinkhole as the only identified “definitive source” of the contamination of the public water system. See 7/17/15 investigation report. (3) CGV failed to preserve watershed hydrologic function through development and implementation of a stormwater management plan. Note: An objective analysis would not conclude that post-clearing, post-construction runoff on a mountainside with 40%+ slopes would be the same as prior to construction. An actual data-based analysis is required —and is required for other construction projects, which are also required to install stormwater management structures to ensure compliance with storm water management regulations. DEQ simply does not apply the regulations to pipeline projects. Note: The MVP would cross the same mountain, the same karst terrain, and a recharge area for the same public water system as the Columbia Gas project. the only significant thing that the DEQ does with respect to pipeline construction is to grant variances to the minimum standard that limits open trench length to 500 feet. 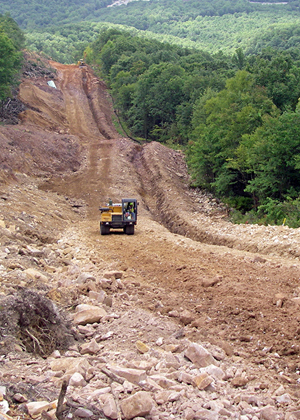 Since DEQ assumed the state’s erosion and sediment control program in 2013, there have been 9 requests for variances ranging from 600 feet to 15 miles (average = 2.3 miles). DEQ approved them all. Dominion officials have stated that the ACP will require variances allowing mile-long open trenches – – that they can’t build the pipeline otherwise. The trenches will be 8-12 feet deep and 20-30 feet wide. Despite state laws and regulations that are supposed to be protective of water resources, citizens have no assurance that these laws and regulations will be implemented. This is alarming, given the unprecedented scale of the the proposed MVP and ACP pipelines. DEQ Director, David Paylor, is ultimately responsible. So far, the definition fits. Slope failure, western side of Peters Mountain, Jefferson National Forest, October 8, 2015. 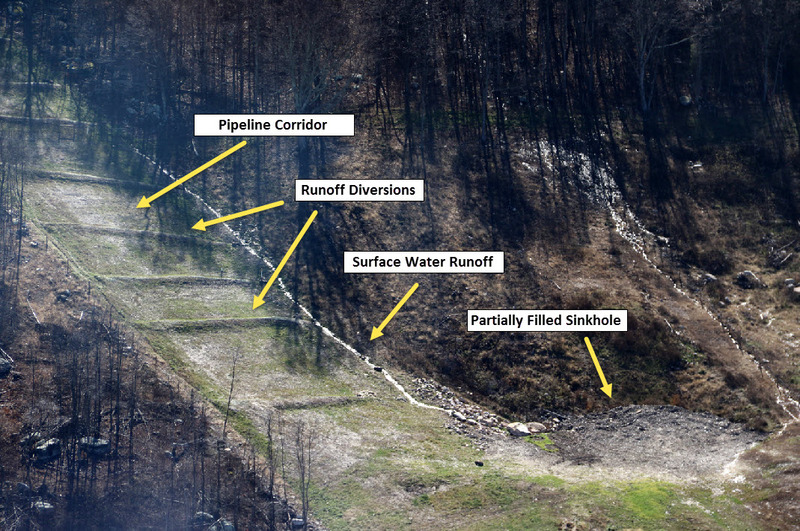 This is the photo that Columbia Gas of Virginia characterizes as misleading. 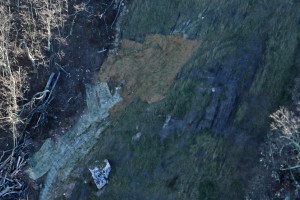 Close-up view of above slope failure area after "repair," showing the repeatedly applied patchwork of erosion control fabric. Click on the image for an annotated version. 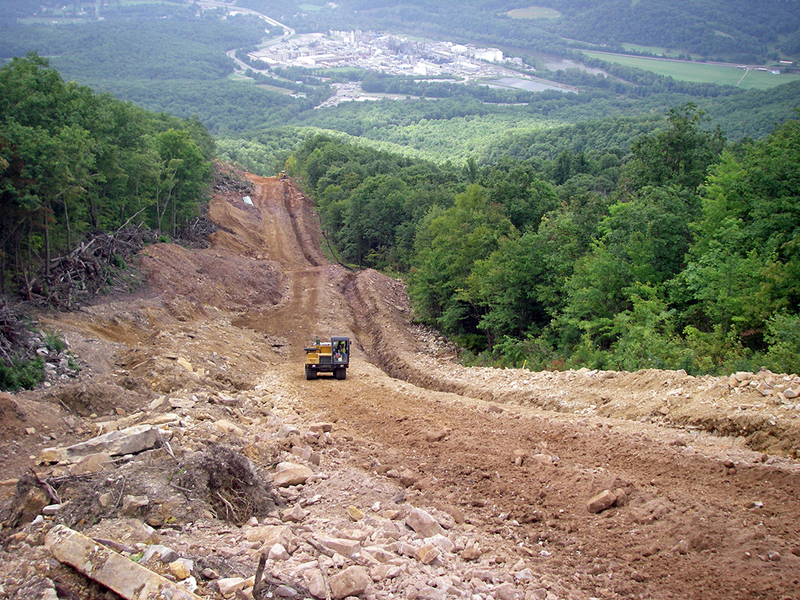 Columbia Gas pipeline during construction. Note that this is a 12-inch pipeline project. The proposed 42-inch ACP and MVP pipelines would require far more excavation and would cross much more of the same problematic terrain. 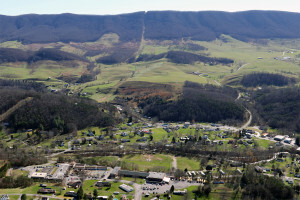 Peterstown in Monroe County, WV, with Peters Mountain and the Columbia Gas pipeline corridor in the background. The town's water treatment plant was offline for over two weeks in July of 2015 after diesel fuel that was spilled at a pipeline staging area entered the karst recharge system. 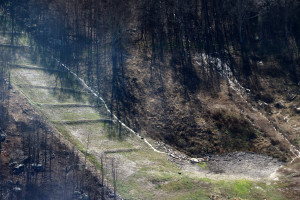 Downslope discharge from the pipeline corridor flowing into a sinkhole at the foot of Peters Mountain. 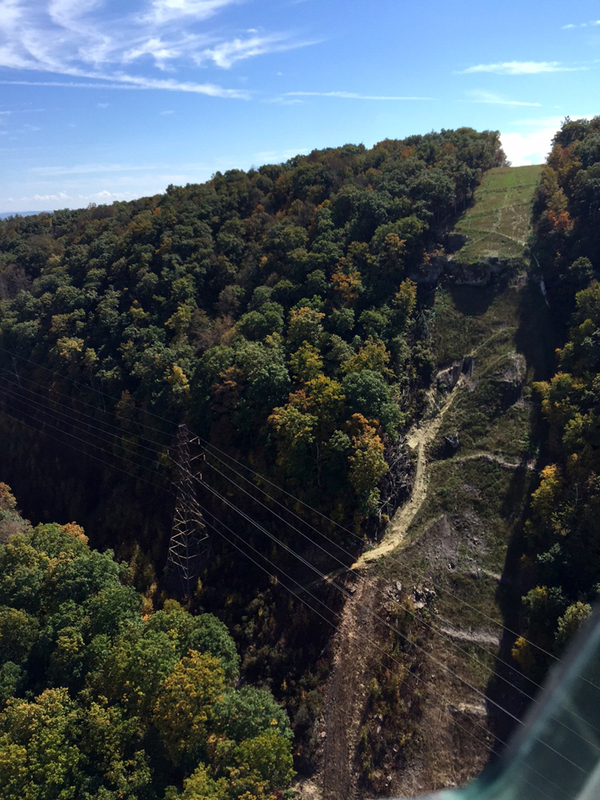 A diesel spill at or adjacent this sinkhole contaminated the Peterstown water supply in the summer of 2015.